The Patriarch, together with a delegation of French prelates in Erbil, came to be among the families of Christians expelled by jihadists. "I bring Pope Francis' solidarity and love," he said. Shias are persecuted in Mosul as well. Their shrines and places of worship have been destroyed as well. The city is suffering from fuel and power shortages. Erbil (AsiaNews) - In the end, peace, not war, will win, said Mar Louis Sako, patriarch of the Chaldeans, in the message he brought yesterday to the Christians who fled Mosul for Erbil in Kurdistan. At St Joseph Cathedral (pictured), the patriarch was not alone. A delegation of French bishops - the primate Card Philippe Barbarin, the Bishop of Evry Michel Dubost and the president of L'Oeuvre d'Orient Mgr Pascal Gollnisch - were present to express their solidarity. "Your visit gives us great comfort," their Patriarch told the French prelates during the Mass celebrated in the crowded cathedral. "Our faith," he added, "will remain steadfast despite all the sacrifices and our hope will remain strong. Our ties to our land, on which our long and deep history is written, are what his Holiness Pope Francis asked me and I will pass it on together with his solidarity and love for you. Let us tell the whole world, peace, not war, will have the last word. " "War has never been a legitimate thing. It is bad thing and leaves people with nothing but slaughter, exile and desolation." "Killing the innocent is a crime against humanity, religion and morals. It is imperative to find peaceful solutions through dialogue, discussion and understanding. In Iraq and our Arab East, people need to feel part of a larger unit and live together without fear, with dignity, security, love and peace." "Man was created free and must not be a slave to anyone, as dhimmi status entails. Christians are true citizens, like their Muslim brothers. Nobody has rights over them. With their open-mindedness and their participation in government, they have given much to Iraq and Muslims." "I urge you to be strong in spite of all your suffering. You will be strong and plant hope and solidarity in trust and courage. Jonah was swallowed by a whale, but came out of it safe and sound. Like him, Mosul (Nineveh) will come out safe and sound from the war." "To conclude, from this church and on behalf of all of you, I speak to our Muslim brothers in the Iraqi region of Kurdistan and the whole world, to wish them all the best on the feast of Eid al-Fitr and beg them to do everything possible to protect man's rights and dignity. The true relationship with others is based on understanding, recognition, acceptance, and respect, with no desire to dominate." For his part, Cardinal Barbarin talked about the visit as an expression of solidarity and sympathy for the Christians of Mosul, about Christ's peace. "Do not be afraid, live in peace. The storm will definitely end," he said. "You must resist, as His Beatitude said. Do not lose hope. Be stronger than evil. Let us twin my diocese of Lyon and that of Mosul." And as a token of what he said, he embraced the bishop of Mosul. Speaking about solidarity, the French government announced that it was offering asylum to Christians forced to leave Mosul. Erbil and more generally Kurdistan are offering shelter to many Christian families forced to flee Mosul after the city was seized by the Islamic Army of Iraq and the Levant (ISIL). 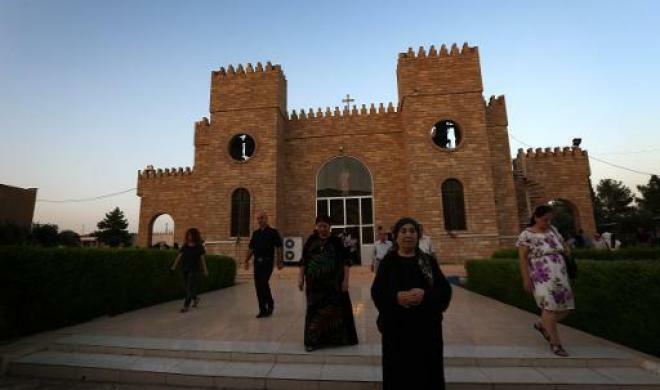 Before 2003, some 60,000 Christians lived in Iraq's second-largest city. When ISIL took control of it a few weeks ago, there were about 35,000. Currently about twenty Christian families are left in the city, according to UN estimates. Still, Christians are not alone in suffering at the hands of extremist Sunni militants. Shias too are hated as heretics and associated with the Shia-led government. Islamist Militants have destroyed or damaged dozens of shrines and Shia prayer halls for being "unislamic", starting with Jonah's tomb. Fuel is becoming scarce, electricity intermittent at best, and "un-Islamic" clothing and other goods that violate the jihadist version of Islam are disappearing from the shelves, as are basic items.